MOORESVILLE, N.C., Feb. 15, 2017 /PRNewswire/ — Each week, Lowe’s Companies, Inc. (NYSE: LOW) serves more than 17 million customers in stores, online, on the phone, in customers’ homes and on the jobsite. To continue helping customers wherever – and whenever – they need support, the company is hiring 1,700 full-time employees between now and October to fill new customer support and central production office positions. Lowe’s customer support centers are located in Indianapolis, Albuquerque, N.M., and Wilkesboro, N.C., enabling the company to provide localized customer support across the U.S. Available customer support positions include representatives to assist the customers who call or email Lowe’s to process orders, schedule repairs or ask questions about specific products. Ideal candidates have computer proficiency and customer service experience. In July 2016, Lowe’s launched a central production office out of its Indianapolis customer support center to provide customers with at-home installation services. Since its opening, the central production office has facilitated nearly 400,000 customer installations. To broaden this service to customers in the South, the company is expanding its central production office within its Wilkesboro customer support center. Available central production office roles, which are based in Wilkesboro or Indianapolis, include service and production coordinators, field project specialists, supervisors and managers. Ideal central production office candidates have a broad knowledge of remodeling, project management and construction practices, as well as strong interpersonal skills. Lowe’s full-time employees are eligible for a 10 percent employee discount, incentive programs, 401(k), discounted stock purchase plan, tuition reimbursement and paid time off for community volunteering. 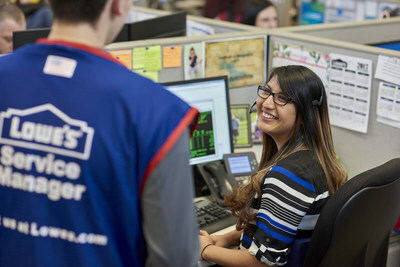 In addition to full-time contact center and central production office roles, Lowe’s is also now hiring more than 45,000 seasonal employees across the U.S. to support customer needs during the busy spring season. To learn more about available positions in your area and apply online, visit jobs.lowes.com or your local Lowe’s store.